It appears that tropical storm Lana has formed. It was very interesting to watch this system evolve. If it had formed just six hours earlier ( east of 140° W - it would have been calleded tropical storm Enrique with the eastern Pacific names. 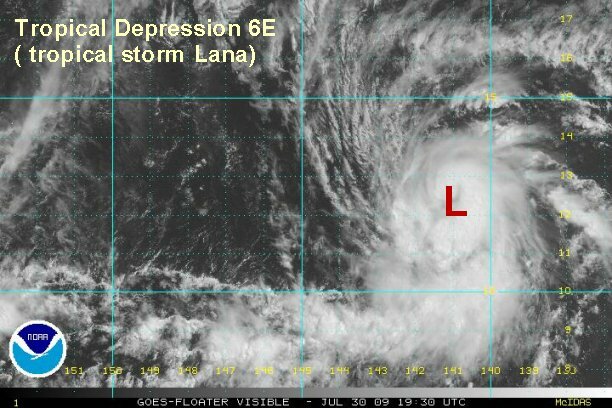 Since it will reach (has reached) tropical storm strength west of 140° it will be named tropical storm Lana. At of 4 pm edt (1 pm pdt / 10 am hst) it was centered near 12.3° N / 141° W or about 1050 miles southeast of Hilo, Hawaii. Lana will officially be classified from its tropical depression status to tropical storm status on the next central Pacific Hurricane Center advisory. We estimate top sustained surface winds of 45 mph. It is moving west north west at about 18 mph. Forecast models show (Lana) moving toward more hostile upper air winds in a few days. Strengthening will be curtailed by that time. Lana should remain south of the Islands. 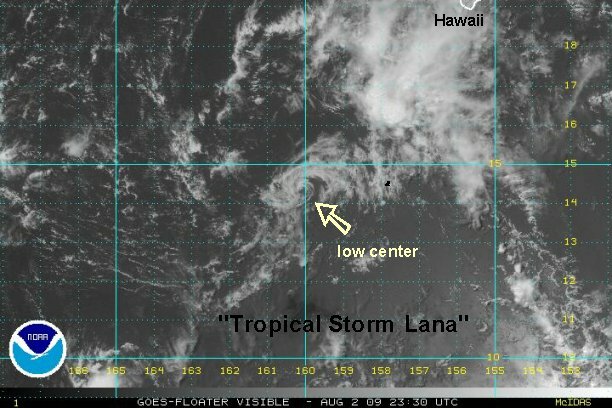 As of 9:30 pm edt ( 6:30 pm pdt / 3:30 pm hst) Lana was centered near 12.8° N / 142.5° W or about 930 miles southeast of Hilo, Hawaii. We estimate top sustained surface winds of 45 mph. This is a little above the official CPHC estimate. It is moving west north west at about 18 mph. Satellite imagery clearly shows this motion now. We believe that CPHC will change their motion from west to west northwest. Forecast models show Lana moving toward more hostile upper air winds in a few days. Strengthening will be curtailed by that time. Lana should remain south of the Islands. 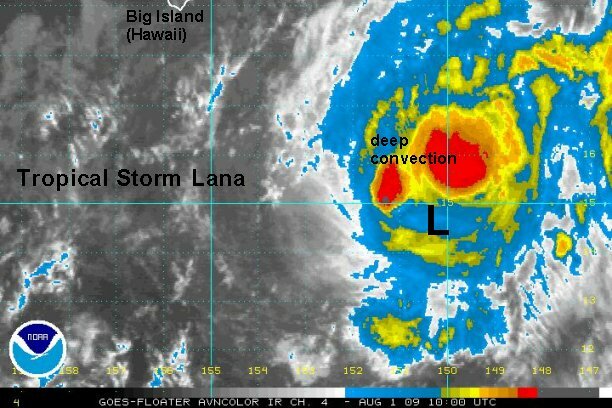 As of 7:30 am edt ( 4:30 am pdt / 1:30 am hst) Lana was centered near 13.5° N / 144.7° W or about 810 miles southeast of Hilo, Hawaii. We estimate top sustained surface winds of 50 mph. This is under the official CPHC estimate of 60 mph. Convection has decreased a touch over the last few hours. Lana had strengthened some last night, but appears to already be fighting some upper wind shear from a strong trough over Hawaii. 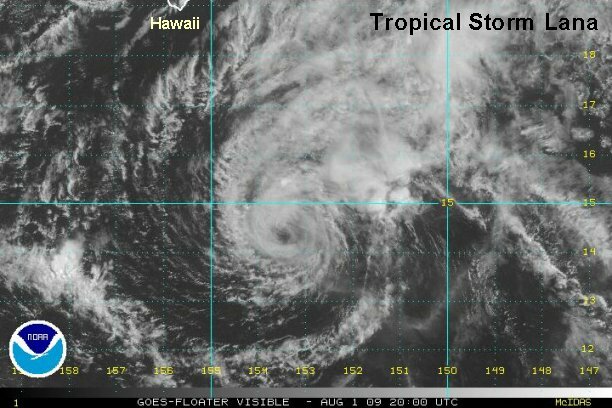 CPHC has Lana becoming a minimal hurricane. At this time we are not committed to hurricane strength with the signs of wind shear to the west. CPHC did change thier motion on their last advisory to agree with our motion assesment. Lana is moving west north west at about 16 mph. Lana should remain south of the Islands. We'll be watching the wind shear today to see if the convection is stripped. If not, some rain may be able to make it to the Hawaiian Islands as it passes to the south. 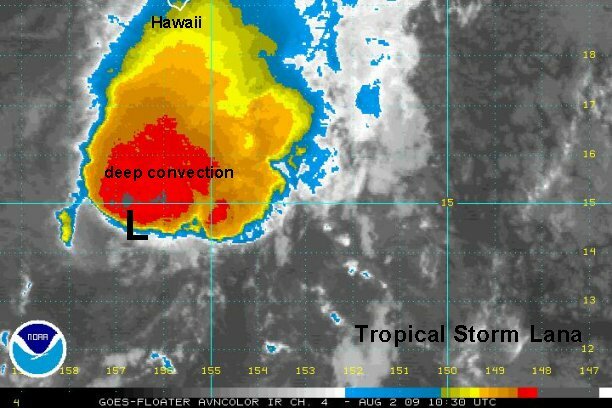 As of 7:30 pm edt ( 4:30 pm pdt / 1:30 pm hst) Lana was centered near 14.0° N / 148.1° W or about 600 miles southeast of Hilo, Hawaii. We estimate top sustained surface winds of 45 mph. This is under the official CPHC estimate of 65 mph. There was a burst of convection a few hours ago. Since then, wind shear from the southwest has dramatically ripped the circulation. The low level circulation is now exposed and the only deep convection is on the north side of the center. CPHC backed off of their forecast from Lana becoming a hurricane. This now follows what we suggested in our earlier update, that the wind shear is too strong for Lana to strengthen. Lana is moving just north of due west at about 19 mph. It looks like a more westerly turn has occured over the past few hours. Lana should remain south of the Islands. 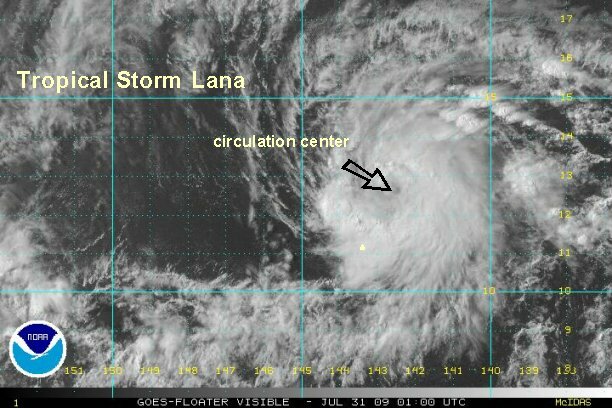 As of 6:30 am edt ( 3:30 am pdt / 12:30 am hst) Lana was centered near 14.5° N / 150.3° W or about 475 miles southeast of Hilo, Hawaii or about 670 miles southeast of Honolulu, Hawaii. We estimate top sustained surface winds of 50 mph. This agrees with the official CPHC estimate. There was another burst of convection a few hours ago. This time even more impressive than the previous time. Top sustained winds probably were close to 55-60 mph for a few hours. Once again though Lana is now in a weakening phase as cloud tops are warming and shearing is increasing. Lana is moving just north of due west at about 15 mph. The quickscat "window of nothingness" was right over Lana, so an excellent estimate of position is not available. It can be very tough without recon or Quickscat to give an exact position estimate overnight. A very impressive upper air trough remains over Hawaii and will destroy the convection by later Sunday, if not sooner. 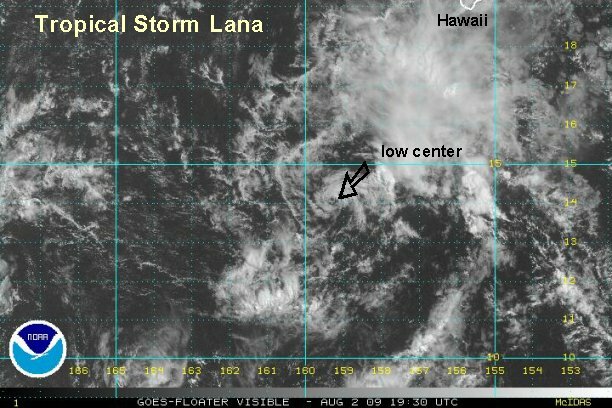 Lana will remain south of the Islands. Some rain showers may increase, especially on the Big Island as Lana passes south. As of 5:00 pm edt ( 2:00 pm pdt / 11:00 am hst) Lana was centered near 14.6° N / 153.6° W or about 365 miles south southeast of Hilo, Hawaii or about 545 miles southeast of Honolulu, Hawaii. We estimate top sustained surface winds of 40 mph...max. This is under the official CPHC estimate of 50 mph. Wind shear has stripped most of the convection away. The only deep convection remains north of the low center. Lana is moving just north of due west at about 18 mph. Lana will remain south of the Islands. As of 6:30 am edt ( 3:30 am pdt / 12:30 am hst) Lana was centered near 14.5° N / 156.7° W or about 375 miles south southwest of Hilo, Hawaii or about 500 miles southeast of Honolulu, Hawaii. Just like yesterday, a break in the upper winds has allowed for the convection to rebuild north of the center of circulation. Six hours ago, Lana was teetering on not even being classified as a tropical storm. It has now gained some strength back. Radar shows rain bands east of the Big Island. Look for increased chances of showers and higher than avergage surf of the east and south shore. We estimate top sustained surface winds of 45 mph. This is under the official CPHC estimate of 50 mph. A recent Quickscat showed a maximum wind of 50 kts or 55 mph. This is not likely a sustained wind value. Another satellite estimate had an estimate of 41 knots earlier. Since Lana is in a strengthening phase, we split the difference and decided 45 mph. Also, The strongest winds are only north of the low at this time. It is likely that tropical storm force winds do not exist on the other quadrants of the low. Lana is moving west at about 18 mph. 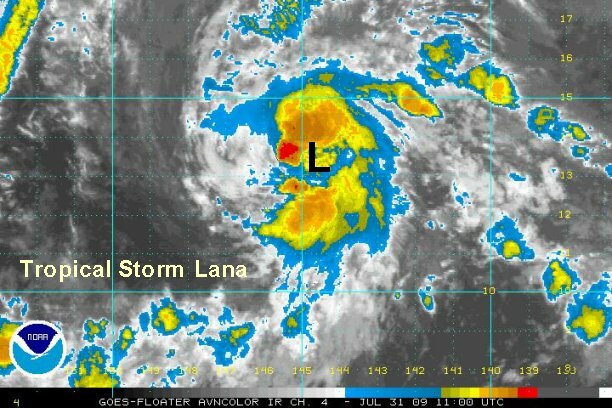 As of 4:00 pm edt (1:00 pm pdt / 10:00 am hst) Lana was centered near 14.1° N / 159.3° W or about 550 miles south southwest of Honolulu, Hawaii. Once again wind shear has flexed its muscle, and this time with a devastating blow. Visible satellite imagery shows only a low level swirl with the circulation center - void of deep convection. CPHC is due to update their forecast within 30 minutes. It is possible that they will still have Lana classified as a tropical storm. We estimate top sustained surface winds of 30 mph. 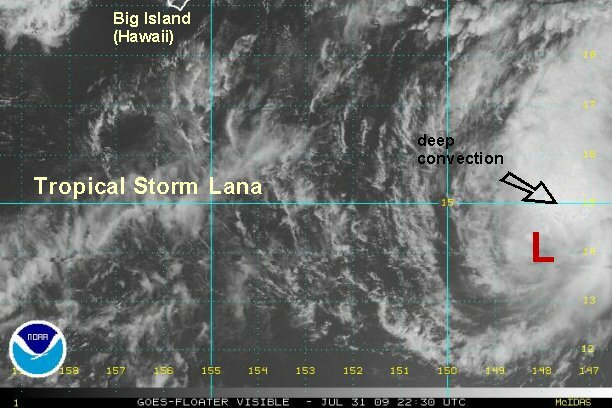 Lana is moving west southwest at about 13 mph. This will be our last update on Lana unless it makes a comeback like the last few evenings. CPHC still has Lana at 50 mph on the most recent advisory (11 am hst). We're sticking with 30 mph. The low is totally naked of convection.